Oniro on Thesen - Knysna Accommodation. This superb holiday home on Thesen Islands is designed for relaxed, easy indoor/outdoor living with large veranda with uninterrupted view of Knysna lagoon and wetlands. The ground floors and all bedrooms have high rafted ceilings, an open plan Lounge, dining room, kitchen, which leads onto a large patio with comfortable outdoor furniture and a deck with a crystal clear pool, and a superb gas Braai. The self catering cottage that is attached to the house has 2 large double bedrooms en-suite. The upstairs bedroom leads onto a patio with stunning views looking out over the Knysna lagoon. The downstairs cottage bedroom has a full bathroom en suite and is totally self-catering. This holiday home has one of the best positions on Thesen Island with uninterrupted views and is very private. A staircase off the deck will lead you to our private floating jetty, where you could tie your own boat or do some fishing. Our large patio deck is ideal for those that wish to sunbathe in privacy and lie next to the pool. Thesen Islands offers a lot to the visitors, both young and old: There is walking, cycling, and swimming at the beaches within Thesen. There are also 2 tennis courts, a squash court, a children's playground and a small grassed 18 holes Golf putting course, all these facilities can be used by our guests. If you do feel energetic after having explored the Thesen Islands parklands, you can stroll to Thesen Harbour Town, which has shops, boutiques and restaurants, including 'ile de pane', oyster bars, Knysna Quays Waterfront or drive to Knysna Town which is 5 minutes away. 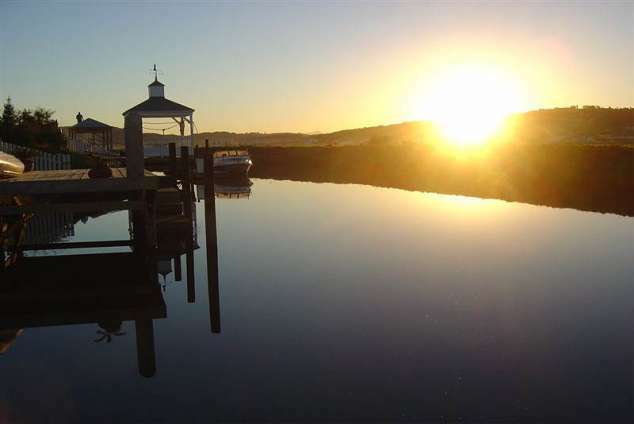 Thesen Islands is a private estate with a gated entrance and is surrounded by the waters of the Knysna Lagoon, offering a relaxed and naturally safe lifestyle, amongst glorious surroundings. Guests use an electronic disk for entering and exiting. Open plan lounge, dining room, kitchen, scullery/laundry. Very large decked patio with sparkling pool and gas braai facilities. One bedroom with2x ¾ beds that can be joined with en-suite shower, basin & toilet. One Bedroom (the Den) has 4 bunk beds, with private shower, basin and toilet. This bedroom leads onto a balcony. Very large bedroom with two single beds that can be joined. Leads out onto a patio over looking beautiful views. DSTV and en suite bathroom with shower, basin and toilet. Large room with double bed, DSTV and full bathroom en suite. It has a kitchenette facility for self catering. DSTV and all Bedrooms have TV's. 14144 page views since 20 Apr, 2011.